When it comes to management, we are always looking for ways to increase the bottom line. My observation is that most CEOs or Managers automatically go to the obvious, GROWTH, right? While cooking breakfast this morning, I was listening to the podcast “Smart Passive Income”. The podcast host, Pat Flynn, was hosting Paul Jarvis, author of Company of One (which is a very misleading title) but that’s for another day. Listening to the podcast gave me the idea for this blog and how I could use it to relate to Community Banking and in doing so, how I could provide added value to my current clients and readers. So…why not concentrate exclusively on Growth? The new buzz word for businesses as it relates to Banking is Scalability but I believe we may be missing a step. After listening to the podcast, I asked myself, “What if, in most cases, we have it all wrong, or at least we have it in the wrong order”? I turned to an indirect mentor and book I often refer to when thinking about a subject. That would be The Road Less Stupid: Advice from the Chairman of the Board, by Keith Cunningham. So I re-read a couple of related chapters on Growth. Suppose that you are the CEO of a mining company. You operate one mine at a time until the lode plays out and then you move on to the next site. Sometimes you might get to thinking that you need to move on to the next site more quickly and maybe increase your production. Maybe, maybe not! After all, you already have the mining equipment in place. You have already done the site work and you have built the tunnels, shafts and transportation infrastructure necessary for production. So why be so anxious to move on when you haven’t fully leveraged the assets you already have in place? In Banking, it appears we look for the next new mousetrap that will create external GROWTH, but it appears we absolutely avoid OPTIMIZING the systems and/or processes that we already have in place. Long-term growth is not sustainable for any business, including Community Banks, without also OPTIMIZING their existing systems and processes. Part of OPTIMIZING systems and processes is instilling disciplines inside those systems and processes before Strategic Growth should occur, but it doesn’t seem to work that way. What we should be doing is OPTIMIZING Credit Analysis on new or renewed loans, OPTIMIZING our servicing processes and credit administration systems. And we should be utilizing Data Mining on our current customer base to create internal GROWTH. I would guess there is so much more opportunity inside your own loan portfolio to hit your growth strategies for the next several years, but we miss OPTIMIZING what we already have, and we go search for the next best mousetrap, GROWTH! 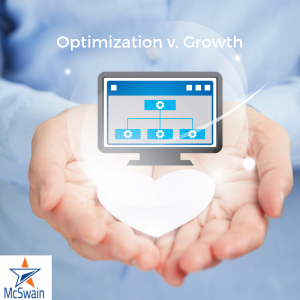 Community banks, if you are interested in OPTIMIZING your loan portfolio and your customer relationships, MCSWAIN CONSULTING can help.